One of my biggest “academic” goals throughout high school has been to create the PERFECT note taking system. While high school is important for the marks, I think it’s more important to set yourself up with good study habits and a good system of learning that will stay with you for life. After a TON of modification and reflection, I’ve settled on this “Mistral Method” of taking notes, and I’m super proud of it. to download this as a printout, click on the image or visit this link. ADAPTABLE | I use it for typed AND handwritten notes, and I even use the same system in my bullet journal! No need to memorize different colour codes and styles. ORGANIZED | I review, not study for tests – all because the process of taking the notes has already ensured I store the material in a logical, organized way – both in my brain and on paper. TEST OF TIME | I’ve been using the same one for the past 2 years for all my subjects and it works perfectly! I’ve thought long and hard about making this a video series or one long video, and I’ve decided make it into a three-part series. 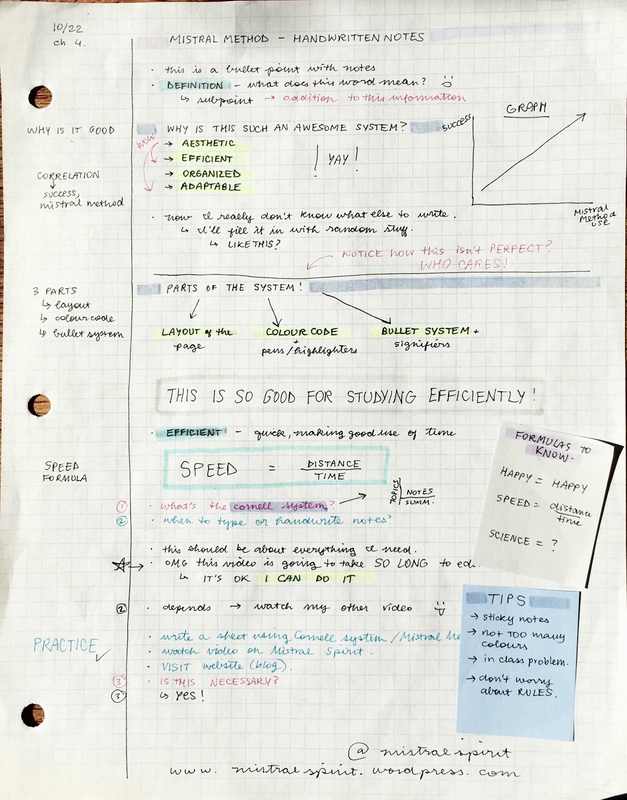 PART 2/3: The Mistral Method: the BEST Note-Taking System! It was SO much fun to work on and to think about this video for the past, like, three months. And I realized DAMN this is one monster of a note-system. But it’s absolutely amazing and I’m so proud of it and I hope you use it and/or get inspired by it. And remember: when it comes to studying, MORE isn’t necessarily better. If you want to see more or have any feedback, let me know in the comments! I love hearing from you! Next postorganization || November Set-Up | Simple but Artsy Autumn Theme! just letting you know, my college professor showed one of the videos you have over this in class today! I am such an unorganized note taker and i feel like this is going to help me a lot. Thanks for the helpful tips! I’m so excited to have stumbled across this!!! I found you on YouTube and I am a min if four and returning back to college to get my dental hygienist degree! I have been watching and searching for ways to get organized and take better efficient notes! What an accomplishment to have figured out how to take a time honored system (Cornell) and make it BETTER!!! I have tried multiple times using that method and just never used the summary section… So onward went my search. I just wanted to drop a line to say thank you for taking the time to do this and share with the world! I’ve already sent several links to my bestie who is on the same scholastic journey as myself. I just wanted to say thanks for this note taking system. I could watch you taking organized notes for hours.